Recently "Jews Against Zionism" group held its inaugural meeting. With three knowledgeable speakers, all of Jewish origin speaking against Zionism, followed by an open discussion made a stimulating evening. The panel consisted of Roland Rance(chair), Alice Coy, Prof. Haim Bresheeth and Lenni Brenner.We were privileged to be able to attend and here we present in full the speeches and discussion. There is something here for everyone to learn from - especially for those who blindly follow Zionism and for those who blindly paint all Jews with the Zionist brush. Jews Against Zionism is an organisation of Jews and others opposed to the Zionist movement and ideology, and to its impact on both Palestinians and Jews. We believe that the conflict in Palestine cannot be resolved without a return of Palestinian refugees and dismantlement of the Zionist structure of the state of Israel; and that this is impossible in the context of two states and a re-partition of Palestine. We advocate the only approach which can lead to peace with justice in the region; we call fro a unitary, secular and democratic Palestine, the return of Palestinian refugees, and full and equal rights for Palestinians, Israeli Jews, and all other people living in the whole of Palestine. 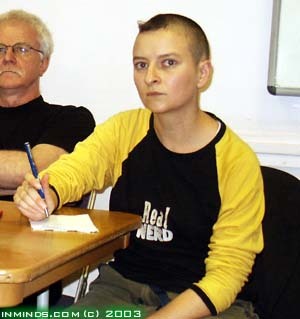 Jews Against Zionism inaugural meeting held at the University of London. The turnout was much larger than expected and the room add to be switched to a large lecture theater in order to accommodate everyone. The meeting was chaired by Roland Rance with speakers Alice Coy, Prof. Haim Bresheeth and Lenni Brenner. 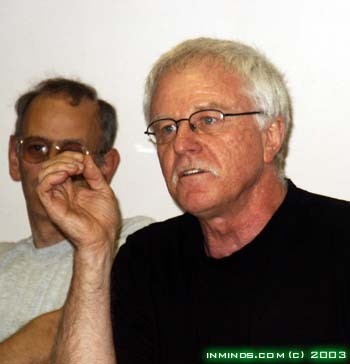 * Roland Rance has been a socialist activist in Israeli, Palestinian and British politics for many years. He was the editor of Return, a quarterly magazine "Against the Israeli Law of Return - For the Palestinian Right to Return". "I went to Rafah, in the Gaza strip. Its a refugee camp of over 140,000 people pilled in to a village of 300 people. Two thirds of the children there are anemic, and that's not because they don't have enough food but that they are too terrified to eat or process the food that they are getting properly. Over half of them wet their beds, hundreds are shot. You meet children walking around that are so traumatized they cant communicate like normal people any more..."
"Going to Rafah was also an incredible experience for somebody who became a friend of mine - a girl called Laura who initially went out to Israel on a Birthright Program [a program that pays for young American Jews to take free indoctrination trips to Israel] ... had very very pro-Zionist views... after e-mail debates ... finally decided to spend a week in each others environment to try and understand the situation. The first night she came down I took her to the house I was staying in. Our friend Abu Ahmed whose house we stayed in took her outside to show her where his trees used to be - his orchard where there is now three lemon trees remaining one of which is partially destroyed which we managed to push back up again after a tank took a slice of it. That was the first thing that shocked her because she was very religious and destroying trees in the Holy Land was completely against everything she believed. And that opened her mind up enough to see what else was going on - no body preached to her but she was very interested and she was in tears because she had this beautiful dream of what Israel was and how she was going to solve all her problems by moving out there. She is still out there in Rafah - one of the last members of ISM still out there - because people can't get back in again. Her visas run out - she had a nervous breakdown and was looked after in Gaza City hospital - she's back out there - back working again - incredibly passionate..."
"People always ask me about Rachel and about Tom because they are internationalists that were killed out there and personally as well they were the people I was closest to who were killed. An hour after Rachel was killed a man called Ahmed Ahmed Al-Najar in an area of Rafah was outside smoking a cigarette. He was 50 years old, he was a street cleaner, he lived with his family, no body could say anything about him apart from he was a simple man. He was outside smoking a cigarette. I saw where he was shot- there were bullets all around where he was shot and several in his body. I was in hospital cleaning Rachel's body when he was brought in to the hospital already dead. He didn't get any media attention of course. 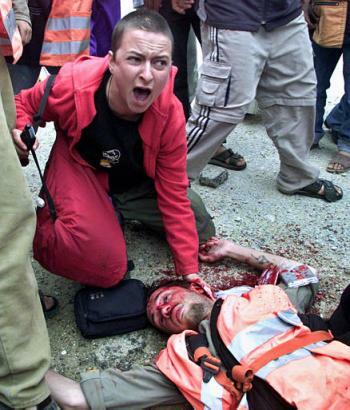 We made a vow that every time we talked about Rachel we would talk about him because thousands of Palestinians are killed - they are killed in the same way as Rachel and Tom which is by a soldier that knows he will never have to pay anything for it, he will never be held accountable for what happened. Its a very lazy decision of him to make whether he pulls the trigger, whether he goes forward in his bulldozer or not, because nobody is going to ask him how many bullets he shot that day and what he did with them, nobody is going to challenge him in any way. Any investigations that do happen, as we found with Rachel and Tom, are going to be incredibly biased and are going to come out with a favourable result for him." 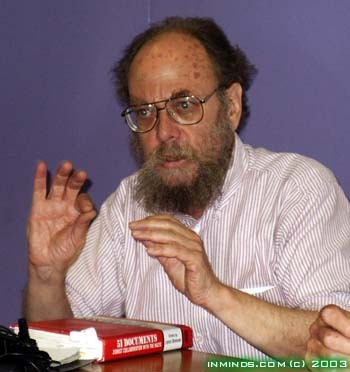 Haim Bresheeth is an activist and film-maker of Israeli origin, living in Britain, where he is Professor of Cultural Studies at the University of East London. He is co-author of The Gulf War and the New Word Order (with Nira Yuval-Davis) - an edited anthology on the first Gulf War, and Introduction to the Holocaust (with Stuart Hood). His documentary films include A State of Danger (BBC2, March 1989) - a film on the early stages of the first Palestinian Intifada. He is currently researching: Palestinian Cinema, Global Media Markets, Cinematic Narrative Structures, Film and memory. "I don't think there is the slightest difference between the different Israeli governments in one important respect - the Zionist project was, is, and will be about the dispossession and expulsion of the Palestinian population of Palestine. It was this, it is this, and it will be this - every Israeli government has done this - it doesn't matter if it was Barak and now Sharon or Netayahu before him - it was no different..."
"Israelis use 41 times more water than Palestinians - well what does it mean? Think about it. Its not just that they have very large swimming pools in the occupied territories - which of course they do, it also means the Palestinians do not have proper water supply for their agriculture which is the only industry such as it is that they are running here and there - there is no other industry that they were allowed to develop all those years. They weren't even allowed to open a bank during the Israeli occupation. Its interesting - most of the water in Israel comes from the West Bank... Palestinians cant even have their tomatoes growing, I'm not even talking about having a wash, cleanliness - I'm talking about very simple things - you cant even grow anything because the water will be cut off for a week at a time. I was in Gaza and my Gazan hosts were apologising to me an Israeli that they cant give me water to drink when we are having lunch with pitta's because the water was turned off..."
"They [Israel] will do everything to make you believe that they want peace - I even believed it once and most of you have believed it - I know that. They will do everything to make sure that people in the West believe that they want peace - they will go to meetings, they will sign documents - they will do all that and then they will make damn sure that there is no chance of any of this happening..."
"If you are making sure in every shop you go everyone knows that because they hold Israeli products you don't buy there - if you bring about the destruction of the Israeli economy which Mr. Sharon is doing such a great job of and you help him in that destruction, more Israelis will come to their bloody senses and will realize that justice is not divisible, peace is not divisible, humanity is not divisible - you cannot divide them. We will have peace - they will have peace, we will have water - they will have water, we will have human existence if they will have it..."
Lenni Brenner, a Marxist and civil rights activist from New York, is an expert on the suppressed history of Zionist collaboration with the Nazis and other Jew-haters. 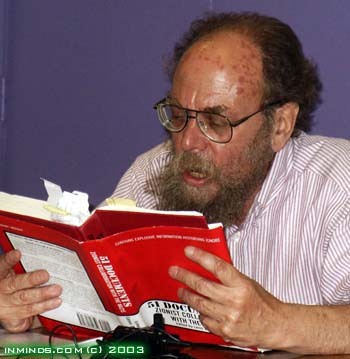 He is the author of Zionism in the Age of the Dictators, The Iron Wall: Zionist Revisionism from Jabotinsky to Shamir, Jews in America Today, and most recently 51 Documents: Zionist Collaboration with the Nazis. "...Our acknowledgment of Jewish nationality provides for a clear and sincere relationship to the German people and its national and racial realities. Precisely because we do not wish to falsify these fundamentals, because we, too, are against mixed marriage and are for maintaining the purity of the Jewish group.. The realisation of Zionism could only be hurt by resentment of Jews abroad against the German development. Boycott propaganda  such as is currently being carried on against Germany in many ways  is in essence UN-Zionist, because Zionism wants not to do battle but to convince and to build ... Our observations, presented herewith, rest on the conviction that, in solving the Jewish problem according to its own lights, the German Government will have full understanding for a candid and clear Jewish posture that harmonizes with the interests of the state..."
Now what I tell people in America is that a lot of fellows who wrote letters like this to Nazis in Europe got hung by the neck until dead after the war. But since these were Jews things went another way. Now let me tell you how the collaboration actually worked. That [letter] was written in June, by August of 1933 they worked out a deal with the Nazis called Haavara (means the transfer). Any German - Jew or Gentile it didn't matter - going out of the country with money in 1933 which is the depth of the depression, got nicked for 40% - in other words you lost 40% of your money - no one is letting money go out of their country in the middle of the depression. What the Zionists and the nazis did was to work out a deal where by if a Jew gave let us say 20,000 marks to the German government, the German government would send 18,000 marks of let us say irrigation pipes to Palestine. The Zionists would then sell them there and give the Jew when he arrived from Germany 17,000 marks. Now that's still a lot better than losing your 40%. The problem was from the Zionist perspective they had a minuscule colony in 1933-39 in other words they were 12% of the population in 33 and about 24% by 1939 - that's still very small. So they began to actually sell German goods all over the middle-east, the even tried to sell them here [in the UK]! ... He declared himself willing to work for Germany in the form of providing intelligence as long as this does not oppose his own political goals. Among other things he would support German foreign policy in the Near East. He would try to find oil sources for the German Reich without affecting British spheres of interest if the German monetary regulations were eased for Jewish emigrants to Palestine. In Jewish national circles people are very please with the radical German policies since the strengthens Jewish population in Palestine would be so far increased thereby that in the foreseeable future the Jews could be reckoned upon numerical superiority over the Palestinians. In 1937 when I had been struggling with Hebrew for two and a half years I has a chance to take a trip to Palestine. We were most interested in the Palestine immigration and I wanted to find out at what point the Jewish State in Palestine might be set up. Unfortunately Palestine was then in turmoil and the British turned down by application. I did see enough to be very impressed with what the Jewish colonists were building up their land. I admired their desperate will to live, the more so since I myself was an idealist. In the years that followed I often said to Jews whom I had dealing with that had I been a Jew I would have been a fanatical Zionist - I could not imagine being anything else, in fact I would have been the most ardent Zionist imaginable. In America we have celebrity endorsements - what I just read to you is the ultimate celebrity endorsement! "51 Documents: Zionist Collaboration with the Nazis"
"...this year there are fourty nine cadets - our human material is extremely intelligent, the majority are university students and thirty of them belong to fascist university youth..."
In other words they were members of the Italian fascist movement - they weren't just pro-Mussolini - they joined his movement. All of them became founders of the Israeli navy - it was founded by members of the Italian fascist party! Proceeding from these considerations, the NMO in Palestine, under the condition the above-mentioned national aspirations of the Israeli freedom movement are recognised on the side of the German Reich, offers to actively take part in the war on Germanys side. A movement that collaborated with the nazis, that allied itself to apartheid, that told American Jews to vote for Richard Nixon [because he was giving them guns during the 73 war], is it an accident that George Bush is their ally today? No. they have to seek their allies among the most reactionary elements in world politics - its only these bizarre elements that are themselves racist that give Zionism the time of day. 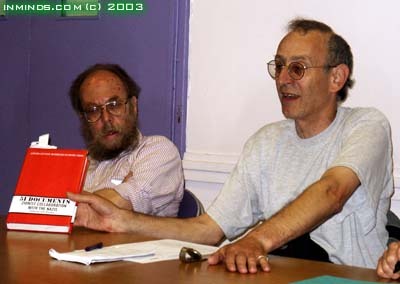 Roland Rance has been a socialist activist in Israeli, Palestinian and British politics for many years. He was the editor of Return, a quarterly magazine "Against the Israeli Law of Return - For the Palestinian Right to Return". For many of us the reason that we are adamantly opposed to Zionism is because yes its committing crimes against the Palestinian people, yes because its condemning Jews in Israel to a life of insecurity and danger, and yes because the Zionist movement ultimately said that Jewish life outside Palestine is not worth savings - the first president of the state of Israel Chaim Weisman referred to the Jews of Europe as human dust not worth saving. For many of us the reason for our adamant opposition to Zionism is not only though it is as well seeing what it is doing to the Palestinians and seeing that there cannot be any solution, any just solution, any lasting solution in the middle-east that doesn't undo the wrong that has been done by the Zionist movement for Palestinians, but also because we say if there is again an up surge of hatred against Jews, the Zionists will not be the ones to protect us - they will be the ones to betray us. And for me certainly its an absolute fundamental for my whole political existence that Zionism is not just something I am opposed to - it is my enemy. 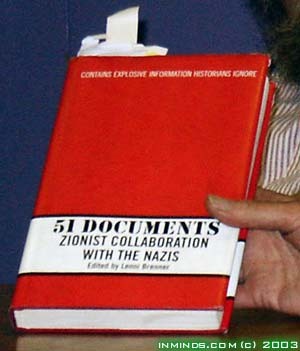 This is part of the reason why we are taking steps to establish an organisation Jews Against Zionism"
Lenni Brenner's latest book "51 Documents - Zionist Collaboration With the Nazis" has just been released. In the UK it is available for sale (£17.95) at Bookmarks, Bloomsbury Way, London WC1. Lenni Brenner's 1983 book "Zionism in the Age of the Dictators" is available for reading on the internet. Its a scrupulously-researched history exposing how Zionism has always worked hand-in-hand with anti-Semites.